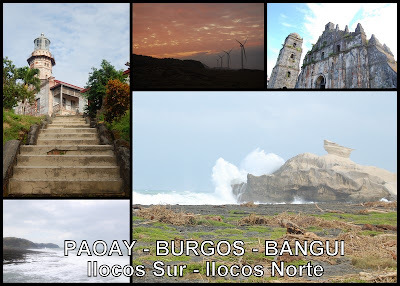 Ilocos has not been in my wow Philippines wish list, but when I bumped into Travel Factor’s post on Photoholic Ilocos: Travel Photography Workshop, I'm off to Ilocos sooner than I thought. Thanks too to President Arroyo's holiday economics. Travel Factor is a budget tour organizer that has attracted a lot of young wanderlust like me. It’s my first time to join them and I’m quite impressed. Leia, the owner, who’s a wanderlust herself, lead the group, and she is really accommodating and treated everyone like friends. Solo travelers were grouped together which saves them from being out of place while small groups were matched with another small group. It was well organized. Detailed itinerary, things to brings, reminders & tips were sent out two days before the trip. Joiners were given IDs, assigned seat number (for the bus) and roommates. Nevertheless it still maintained a certain level of flexibility. It was a joy being around this group of 40 - about 13 Filipino-Chinese, 1 Indian, and the rest Pinoy. I thought it's going to be difficult to move around and take decent photos with a big group, but not when you're with photoholics. It was like a battlefield, where each finds his own little nook to get that perfect shot. No one was rowdy, everyone was out to enjoy the sites, learn travel photography and meet new friends. After nine long hours on rough roads aboard the private overnight bus from Manila with an inflatable neck pillow and a jacket, we reached St. Augustine Church of Batay & Bell Tower around seven in the morning. Frankly, I’m not quite sure if I fell asleep! We checked-in in Villa Angela, Vigan, Ilocos Sur. It's a 135 year old ancestral home, formerly the house of a Kapitan Silio (Mayor). Our guide hinted about haunted stories, all I can do is pray for a long good sleep when evening comes and not wake up having the need to go to the bathroom located outside on the balcony. 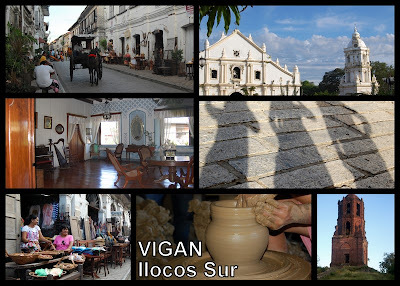 Aside from pottery making, Vigan is best known for being listed as UNESCO World Heritage for its best preserved 16th century planned Spanish colonial town in Asia. It’s a pretty small town, a walking tour can be over in a hour or two. We were left on our own to wander around Plaza Burgos, Plaza Salcedo, St. Paul’s Cathedral, and Calle Crisologo. It has its own beauty - quiet, quaint, plain and simple unlike Macau’s elaborate architecture and bustling streets swarmed by tourists. With an hour left before dinner time, we opted to go on a side trip to Chavit Singson’s Baluarte which is about forty pesos and fifteen minutes away by trike. Entrance is free. 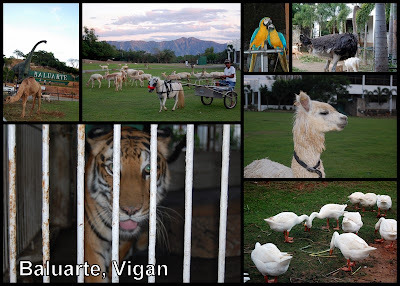 Unlike the usual zoo, the animals here (ostrich, camels, ducks, pony, deers…) are free to roam (except of course for the tigers) and visitors are free to touch and feed them. The caretakers shoo away the animals by stamping their feet. Voila! The animals were rushing while we were in the middle of them. We can’t help but panic for a second thinking “it’s stampede!” and rush to find shelter by the nearest fence. Little do we know, these animals were rushing to their respective barns/areas since it’s feeding/closing time, whew! As we head towards where the tricycles are parked, we found a vendor with empanadas. His warm hospitality lured us to try a piece of special empanada and even gave us the regular one for free and insisted we sit on their table. Vigan empanda is stuffed with sliced cabbage, longganisa and more, with wrappings made out of rice - deep fried to crisp, it tasted really good. We headed back to Calle Crisologo for some night shoot. After a long day, I had a good night sleep on that four poster bed of Villa Angela. It’s another early day, as the bus head on a long ride to Paoay Church, Paoay and a short stop at the Sand Dunes of Laoag. The sand dunes is dubbed by Lonely Planet as the only one in the country. On these sand dunes, a few grass has sprouted and talks had it that it will soon be converted into a residential area. Single serve buffet lunch was served at MACVN Food House in a quiet town of Burgos. It’s a small eatery but in fairness, our tables were set with tablecloth! Seems like they have catered to a lot of artists with the likes of Regine Velasquez, Jericho Rosales and Heart Evangelista, shooting on location with the numerous pictures hanging there. Next stop was, Capurpurawan Rock named after “puraw” which means white should be my fave stop. After some ten minute trike ride from the jump-off point was a spectacular view of mountains on one side, the South China Sea and the Capurpurawan Rock on the other. It took another fifteen minutes of easy trek down, over rocks and roots to get to it. The ambience was just perfect with sunny skies, strong cool winds, sounds of raging waters occasionally splashing on non-suspecting travelers, what else could you ask for? In a town so small the guide knew a bus load of girlscouts were coming, true enough they did, hundreds of them, just in time for us to move to Cape Bojeador’s Lighthouse. It was another trike ride uphill from the jump-off point. We got to the top and it’s one eerie old structure I must say. We can’t stay for long since we had to catch the sunset at Bangui Windmills. These windmills are so tall and huge that stood by the seaside. The wind was harsh sweeping the coarse beach sand in the air and onto your skin. It’s a must to keep your jacket, shades and long pants on. Just before the sun sets, the weather failed us, it began to drizzle. 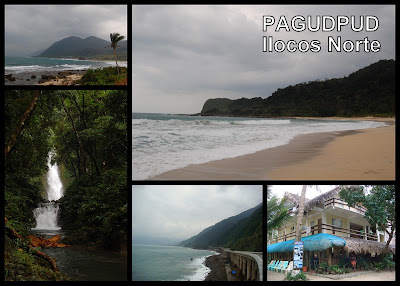 We head to Polaris Beach House in Pagudpud where we will stay for the night. After another long day, the food wasn’t enough to fill us up, we would have wanted to try out bagnet but it was not available, an order of grilled liempo came an hour later. It is customary for food to served that long in provinces they say, inherent in a laid back lifestyle. It was a 30 minute trek on occasional slippery rock / mud, crossing slightly strong current of the stream for at least three times before one gets to the enchanting Kabigan Falls, the trekking shoes I brought was just apt for this activity. The rangers served as human rope line making sure no one slips especially with a camera in tow. I enjoyed the trek back halfway alone, taking pictures here and there. The rest of the day was spent hopping in and out of the bus, sight seeing around Bantay Abot, Patapat Viaduct & Aqua Grande and beach hopping in Maira-ira Blue Lagoon and Saud Beach. The cool weather and drizzling afternoon wasn’t inviting for a swim but for a nap instead. After dinner, we head south for an 8-hour long road trip back to Manila. It was a hell of a ride, the bus was drifting in those bumpy winding roads that woke me up every so often. 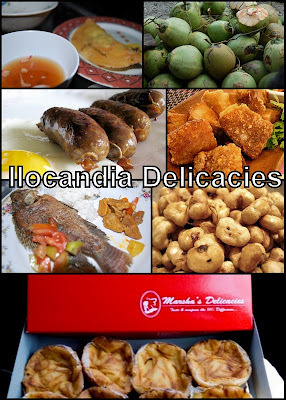 By midnight we reached Vigan and picked up the longganisa and vinegar by Villa Angela and stopped at the 24-hour pasalubong center - Marsha's Delicacies for some royal bibingka and chichacorn. It was around 8 in the morning when we were awaken by the bustling city and traffic of Manila. I was amazed by the long queue at the MRT station that was overflowing out on the streets. It must be sheer luck to get to work on time after a long weekend.